How Should a King Come? 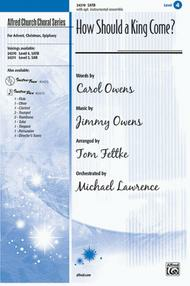 composed by Carol Owens, music by Jimmy Owens. Arranged by Tom Fettke, orch. Michael Lawrence. Choir Sacred. SATB choir. Choral (Sacred); Choral Octavo; Worship Resources. Sacred Choral Series. Advent; Christmas; Epiphany; Sacred; Winter. Grade 4. Choral Octavo. 12 pages. Published by Alfred Music (AP.24370).A majestic Christmas march! Tom Fettke has arranged Jimmy and Carol Owens' powerful chorus with solid choral writing and colorful sequencing keys that respond to the magical poetry of the text: King Jesus will come, not in splendor, but in a humble manger in Bethlehem. A timeless masterpiece, certain to become a seasonal favorite!Inst. Parts Available (choral); Recorded Acc. Available.